Help your hummingbird feeder stay free of ants using the Stokes Red Hanging Ant Moat. This convenient unit creates a physical barrier for a hanging hummingbird feeder, preventing crawling insects from reaching it. The 3.375" diameter bowl can be filled with 5.7 ounces of water, and its top hook and looped base allow it to hang directly above a feeder. The water forms a natural deterrent, as ants are hesitant to swim. This keeps them from reaching the nectar and sullying it for the birds. 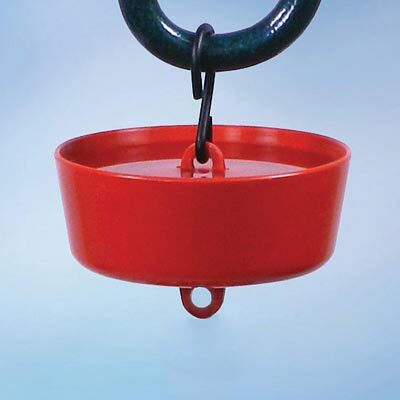 The red color enhances traditional hummingbird feeders, and the plastic construction adds durability. Prevent ants from reaching your favorite hummingbird feeder with this Red Hanging Ant Moat.